Gent’s King Albert park has a huge public fountain. This fountain does not only provide refreshment to the visitors of the park, it is also a great source for hydropower. 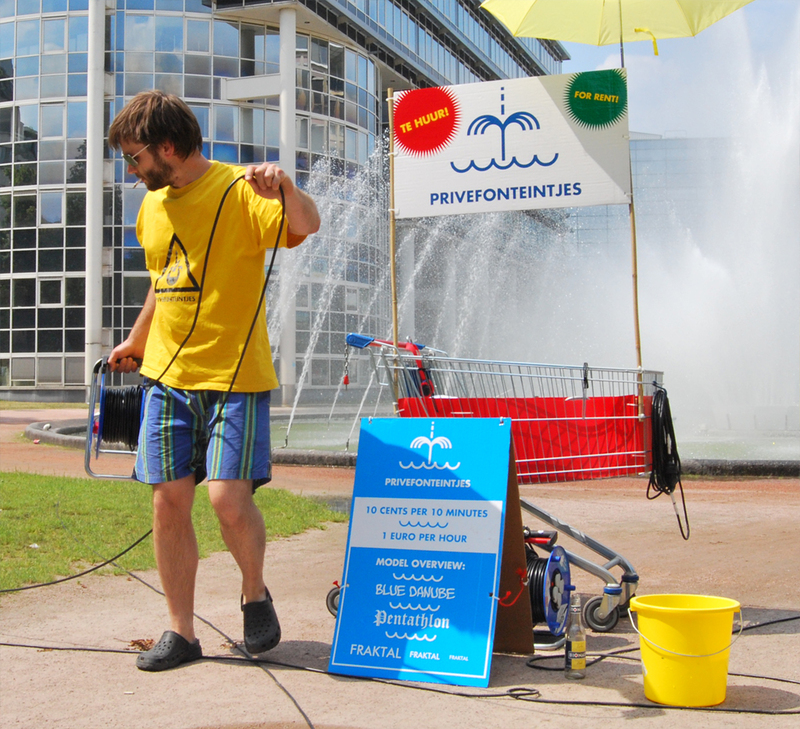 In a performance in Summer 2010, Jari Suominen and me attached water wheels to that fountain, in order to produce electricity. 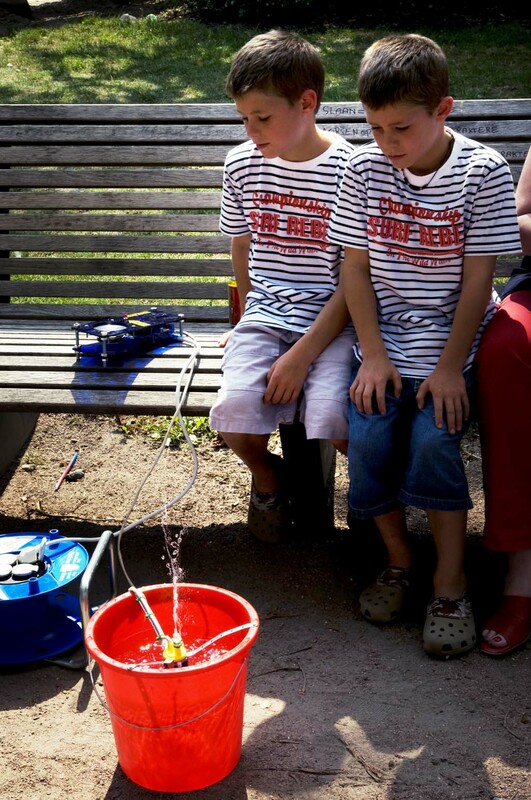 Then we used this self-made electricity to drive a series of small electric bucket fountains, which we rented out to people in the park. Here, I'm attaching a water wheel on the big fountain in the park. 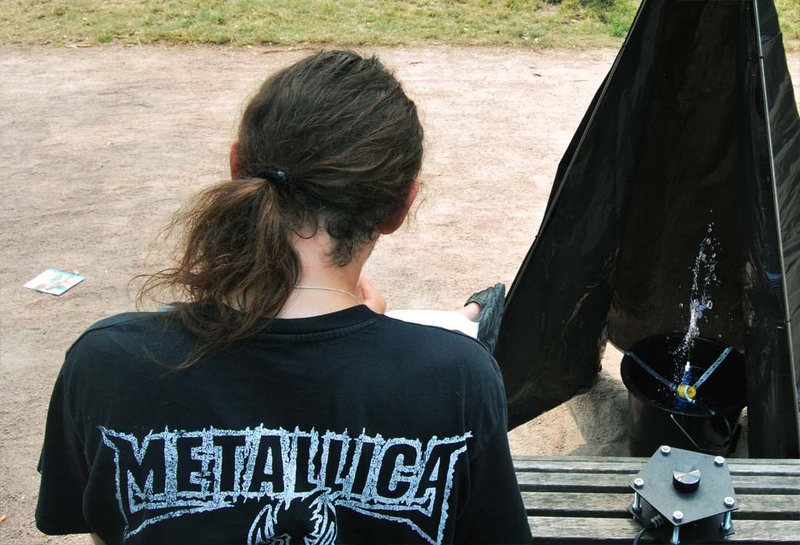 Below is a picture of our little mobile rental booth, which we built on a shopping cart. Even though our installation was working with low voltage, we used regular 220V cable drums to distribute the electricity. Model “Blue Danube” was playing Richard Strauss’ famous song. A built-in light show and the modulated spill were synced to the music. Model “Pentathlon” had a pentagonal controller for controlling the spill’s hight. It was set up in a dark tent and featured a hypnotic LED strobe light. Model “Fraktal” had a little water wheel which was powered by the spill. Here, we were distributing the little fountains. And we made sure that every customer gets the fountain that matches their taste best. Those kids were enjoing model “Blue Danube”. For producing the electricity, we used Shimano bicycle hub generators as they provide already a serious amount of electricity, even when turned with low rpm. So we could avoid the use of gears in our system. Another advantage was their reliable operation in moist environments: They’re designed to work even in heavy rain, so some shower from the fountain didn’t destroy them right away. They might not last forever in the heavy waters of a fountain, but this was anyway just planned to be a one day performance. The water wheel’s blades were cut out of standard PVC drain pipes. That made the whole setup quite cheap. The voltage which an electric generator produces depends on the rotation speed and on the resistance of the circuit that it drives. Due to the fountain as power source, in our case the rotation speed was very steady. And in order to have an efficient system, we wanted the generators to produce as many Watts as possible. So we tried out different resistances on the generators. You can see in the diagram below, that one generator produced more than 5 Watts (ca. 400mA, 14V), when the resistance of the circuit that it drove was about 28 Ohms. We didn’t use the AC that came directly out of the generators, as we used DC pumps for the little fountains. First we rectified the electricity to DC voltage and then smoothed it with some large caps. For the small fountains, that also involved microcontrollers (“Blue Danube” and “Pentathlon”), we finally cropped the voltage with some low-drop regulators (and huge heatsinks). That’s it about how we generated the power. It all worked fine. It seemed to be a nice system which could be also used for other low-power electricity needs in the city. 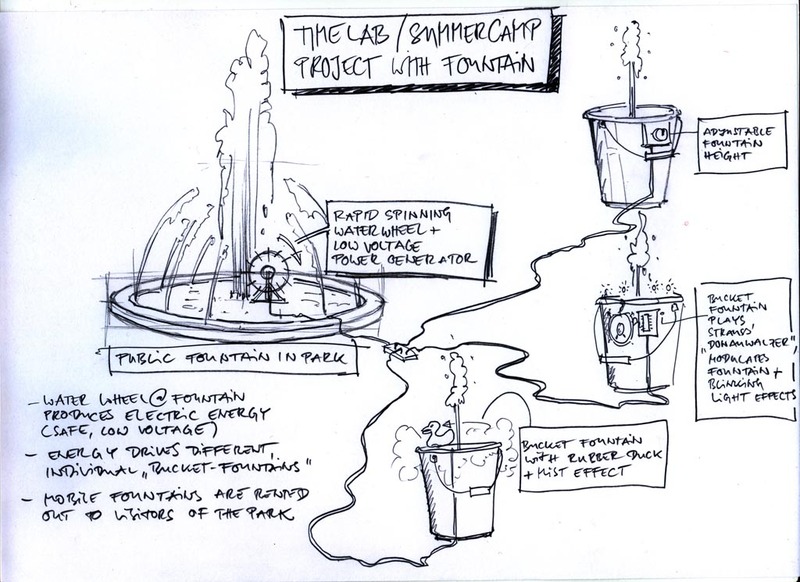 We made this project at Timelab’s “Summercamp Electrified”. Thanks to Timelab for inviting us! And thanks to Stijn Calis and Cas van Nieuwenhuyse for making the video.